Is a CPAP Mask Right for You? Home > CPAP Machine Toronto > Is a CPAP Mask Right for You? 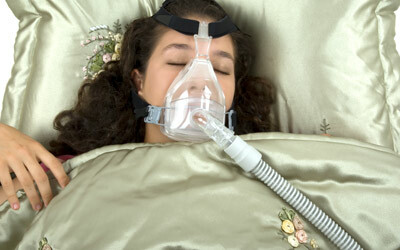 If you have a sleeping disorder such as sleep apnea, a CPAP mask is often the recommended treatment. It’s usually recommended for adults, although there are small, lightweight masks available for children as well. You may be required to undergo an overnight sleep study in order for a specialist to evaluate your level of sleep. Even if you don’t have sleep apnea, there are other conditions for which CPAP treatment is recommended, such as chronic hypoventilation or excessive snoring. Once again, the best way to find out if you have sleep apnea is to arrange for a specialist to observe your sleeping in an overnight test. How do CPAP Masks Help? Continuous positive airway pressure machines are designed to supply a constant, steady amount of air pressure to help you breathe more easily while you sleep. Most people who have sleep apnea are unable to breathe properly when sleeping due to an obstruction in the airway. These machines come with a mask that goes over the face or nose. There are full masks that cover the nose and mouth as well as partial masks that just cover the nose. There are other treatments of sleep apnea, but they are either not as effective or too extreme. There are oral appliances, such as mouth guards and orthodontic devices that you can wear during sleep. However, some people find them to be either ineffective or uncomfortable. Surgery is also an option, although most people don’t want to go that far. CPAP machines may seem like a nuisance at first, but they can be very helpful once you get used to wearing them. Why Choose CPAP Masks Over Oral Devices? A CPAP mask, provided you have the right size and style, is more comfortable than oral devices. Mandibular advancement devices, for instance, are designed to push the lower jaw down to force the tongue forward so that they airway stays open. Tongue-retaining mouthpieces are actually worn orally and adjust the position of the tongue while you sleep. This device goes onto the tip of the tongue and rests on the lips. A CPAP mask is simply placed over the face and doesn’t force the jaw or tongue to stay in a certain position. The only way it might be a problem for you is if you are claustrophobic. However, there are smaller models available that don’t cover the entire face. If your partner keeps complaining that you are snoring, you may need a CPAP mask. Snoring is caused by an obstruction in the breathing passage. It’s a sign that you are not getting the sleep you need. You’re also keeping your spouse awake. While not all snorers have sleep apnea, it’s still a problem that requires some type of treatment. If you don’t want to undergo surgery, a CPAP machine should be in order.